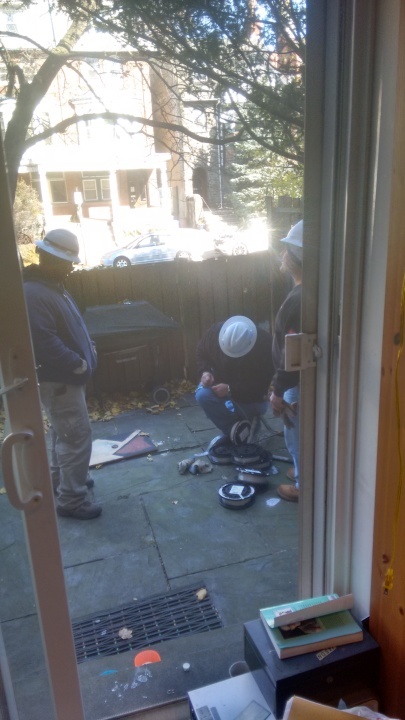 Subject: The fiber guys are here! When the rest of Philadelphia was being wired for broadband Internet, my little cluster of 46 houses was somehow skipped. We have been limping along with copper DSL for the past ten years, to everyone's frustration and especially that of my kids. Our homeowners’ association has spent the last five years nagging and chivvying the communications monopolies to honor their legal commitments and provide us with high-speed internet. Last month the phone company sent a team of workers to install conduits for our new fiber-optic cables. Today these guys are in my back yard running the cable.